The Kinesio Taping® Method is a definitive rehabilitative taping technique that is designed to facilitate the body’s natural healing process while providing support and stability to muscles and joints without restricting the body’s range of motion as well as providing extended soft tissue manipulation to prolong the benefits of manual therapy administered within the clinical setting. Latex-free and wearable for days at a time, KinesioTape is safe for populations ranging from pediatric to geriatric, and successfully treats a variety of orthopedic, neuromuscular, neurological and other medical conditions. The Kinesio® Taping Method is a therapeutic taping technique not only offering the patient the support they are looking for, but also rehabilitating the affected condition as well. By targeting different receptors within the somatosensory system, Kinesio® Tex Tape alleviates pain and facilitates lymphatic drainage by microscopically lifting the skin. This lifting affect forms convolutions in the skin thus increasing interstitial space and allowing for a decrease in inflammation of the affected areas. Based upon years of clinical use, Kinesio Tape is specifically applied to the patient based upon their needs after evaluation. The findings of the clinical evaluation or assessment dictate the specifics of the Kinesio Tape application and other possible treatments or modalities. With the utilization of single “I” strips or modifications in the shape of an “X”, “Y” or other specialized shapes as well as the direction and amount of stretch placed on the tape at time of application, Kinesio Tape can be applied in hundreds of ways and has the ability to re-educate the neuromuscular system, reduce pain and inflammation, enhance performance, prevent injury and promote good circulation and healing, and assist in returning the body to homeostasis. Evaluation and assessment are key in the treatment of any clinical condition. In order to get the desired results from a Kinesio Tape application as well as any other treatment, a full assessment of the patient is necessary. In some cases, the treatment of a condition may require treatment of other underlying conditions as well. This assessment should include manual muscle testing, range of motion testing, gait assessment, and any other orthopedic special tests that the doctor deem necessary. The information gained from these assessments will allow for the proper treatment protocol to be laid out. Kinesio Tape can be a valuable addition to this protocol. It has been proven to have positive physiological effects on the skin, lymphatic and circulatory system, fascia, muscles, ligaments, tendons, and joints. It can be used in conjunction with a multitude of other treatments and modalities within the clinic and is effective during the rehabilitative and chronic phases on an injury as well as being used for preventative measures. Education is a one of the key elements of the Kinesio Taping Method and its continued success in the world of therapeutic taping. Along with certified KT practitioners around the world, Dr. Kase the original inventor or Kinesiotape, is dedicated to advancing the art and science of the method through education, clinical practice and research. It is vital that a consistent standard of practice is maintained and allied health professionals wishing to learn more about the Kinesio Taping Method are encouraged to participate in seminars and courses which are offered by Certified Kinesio Taping Instructors (CKTI). After completing a certification course, practitioners join a select group of medical professionals who are able to properly use the Kinesio Taping Method within their realm of practice. By now, many people have been able to observe the highly visible athletic uses and the familiar colors and taping patterns used by successful Olympic and professional athletes. It is a unique therapeutic tool that has provided new options in rehabilitation and sports medicine throughout the world. This amazing elastic therapeutic tape has been designed and engineered by Dr. Kenzo Kase for more than 30 years in Japan. It creates a lifting effect on the skin’s surface, which improves circulation and relieves pain. It may be applied using different amounts and directions of tension, so the tape has the ability to relax or stimulate muscles. It is made of gentle cotton fiber. It features a 100% medical-grade acrylic adhesive. It is totally latex free. It does not limit the wearer’s range of motion. The distinctive wave-pattern weave moves with the wearer’s movements. It allows for 3 to 5 day wear time to provide 24-hour results to the patient and to provide for an economical treatment. 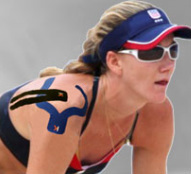 Many professional and olympic athletes are now using this taping technique to help combat and recover sooner from injuries. You don't need to be a professional athlete to be medically treated like one. At Peak Performance Chiropractic, we care for you just as if you are in the NBA, MLB, or NFL. We will get you back to your sport, back in the gym, or just feeling back to normal, ASAP. Coupled with Chiropractic Adjusting and related therapies, Kinesiotaping is an effective weapon against pain and injury.